Have you ever wanted to try racing your bike? Or maybe you have raced already, and would love to hone your skills? Join other cyclists for a one day clinic focused on road-racing skills with simulation racing clinic and the chance to put everything into practice immediately with sanctioned racing! 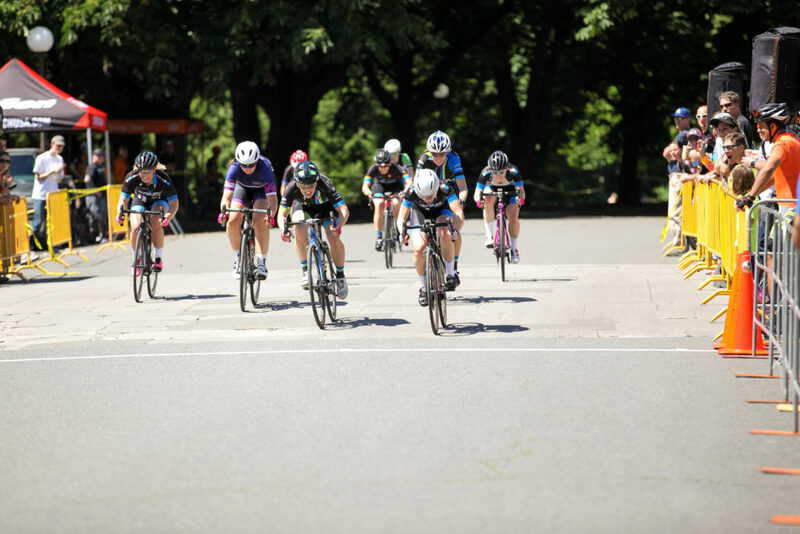 Team Thrive is delighted to once again partner with other leading NW cycling teams to offer a coached clinic for women who are thinking about road racing and want to learn – or improve on – the necessary skills to race effectively and safely. No previous race experience is needed – this clinic provides an opportunity for new racers to learn what it takes to race on the road. The women’s clinic is being led by Marsa Daniel of MD Endurance Coaching and she has much to offer to new racers as well as experienced Cat 4 and Cat 3 women. racing skills – cornering, sprinting, pack riding & pacelining – along with guidance on how to structure a race warm-up and the opportunity to do some simulated racing so that you get a feel for the experience. Put your newly learned skills into practice and start earning category upgrade points immediately, with USA Cycling sanctioned racing sponsored by Team Thrive and BuDu Racing on the closed Pacific Raceways track that very same afternoon! Racing will be separated by category so that you can race with others of similar ability and experience. 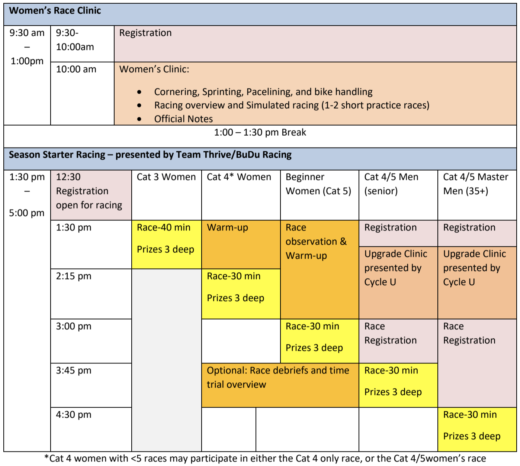 Note: Racing is available to all Cat 3, 4, 5 women and to Cat 4/5 men regardless of clinic participation. 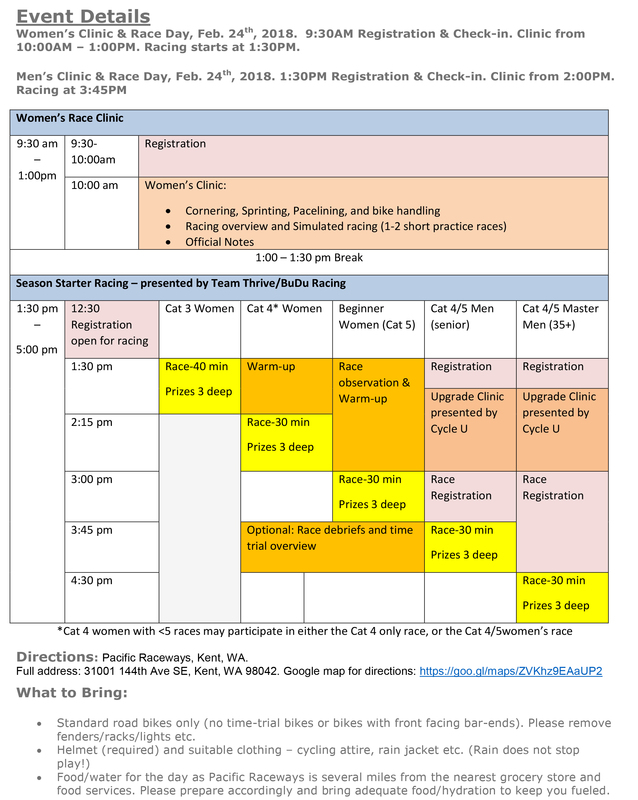 Women’s Clinic & Race Day, Feb. 24th, 2018. 9:30AM Registration & Check-in. Clinic from 10:00AM – 1:00PM. Racing starts at 1:30PM. Please Note – The upgrade clinic for men is canceled, though the racing is still scheduled. Directions: Pacific Raceways, Kent, WA.  Standard road bikes only (no time-trial bikes or bikes with front facing bar-ends). Please remove fenders/racks/lights etc.  Food/water for the day as Pacific Raceways is several miles from the nearest grocery store and food services. Please prepare accordingly and bring adequate food/hydration to keep you fueled. « Women of Cross, August 26th!